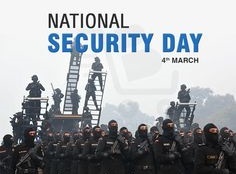 March 4 is observed as National Security Day to praise the work of security forces, who plays a major role in maintaining peace and security of the people in India. The day is also known as Rashtriya Suraksha Diwas. This day is dedicated to all the security forces such as policemen, commandos, guards, army officers, para-military forces and other persons involved in security, who sacrifice their life for maintaining the stability of the country. National Security Council (NSC) – Established by the then Prime Minister Atal Bihari Vajpayee in 1998. NSC is an apex agency looking into the India’s political, economic, energy and strategic security concerns. National Security Adviser is Ajit Kumar Doval. He is the Chief Executive of NSC and Primary Adviser to the Prime Minister on issues related to National Security. The Intelligence Agencies like RAW and IB report to the National Security Adviser.